The Food Alphabet and More: Seattle's Best Christmas drinks + Seattle's Best 2014 Planner giveaway! 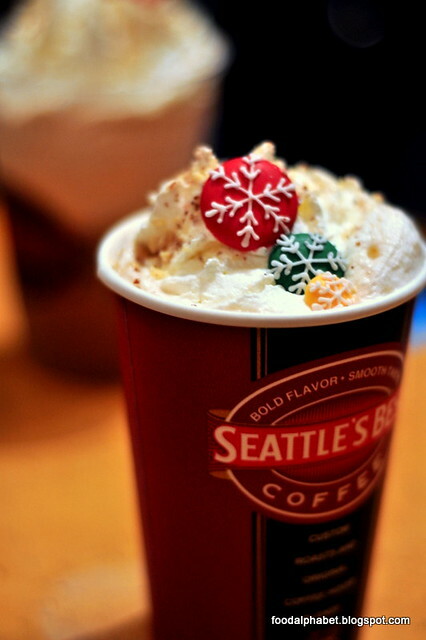 SBC's white chocolate mocha, combined with eggnog and cinnamon vanilla flavors topped with whipped cream and sprinkled with silver candy beads. SBC's white chocolate mocha infused with gingerbread syrup, garnished with whipped cream, topped with Christmas tree candy sprinkles and the super cute gingerbread candy man, who is always peeking on the side. SBC's classic mocha, mixed with roasted hazelnut and coffee syrups topped with a cloud of whipped cream, generous servings of crushed hazelnuts and snowflakes candies. 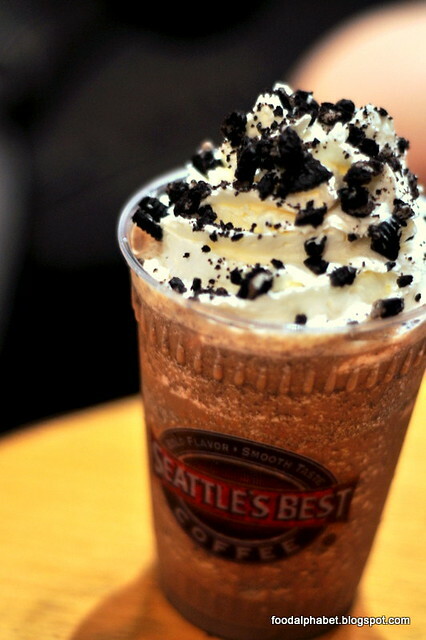 SBC's classic mocha with a tempting mix of Oreo cookies and mint syrup covered with whipped cream and crushed Oreo cookies, is a SBC all-time favorite Christmas drink. All flavors are available in hot mochas or Javakulas. Try them all and tell us which is your favorite? Me? I just love the Eggnog Frost. Just light and so full bodied, it makes drinking mocha drinks more than just amazing with every sip. So much love and devotion has been put into making every cup of Seattle's Best drinks special not just for us, but definitely for you. 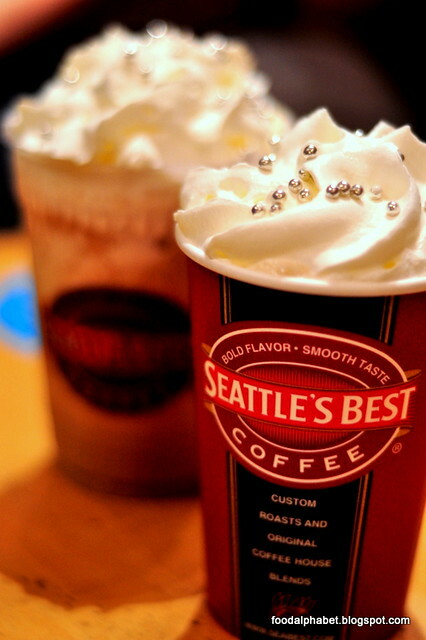 What else has Seattle's Best Coffee in store for us? 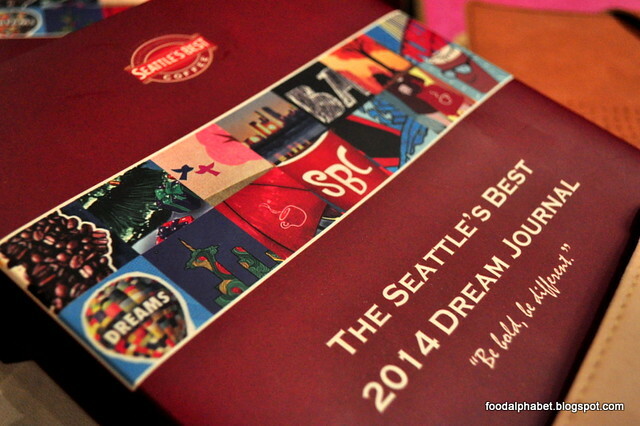 It's The Seattle's Best 2014 Dream Journal! Available in four delightful colours, purple, charcoal gray, brown and peach. This year's dream journal is packed with so much features and freebies, you would definitely want one to get you through 2014. What's in store for us? 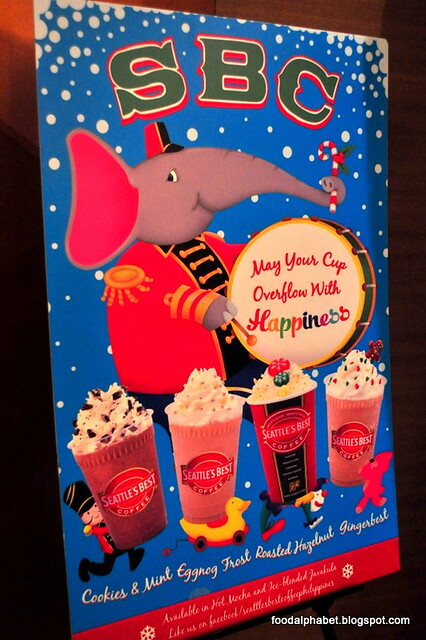 They have a CD, with songs hand-picked by Seattle's Best to let you enjoy that great cup while listening to great music, a monthly calendar, one double coaster, which you will totally love. A metal bookmark, notepads, stickers and a whole year of freebies! Now tell me you don't want this. How to get it? Just visit any Seattle's Best Coffee and get to order complete 18 stickers, 1 coffee drink = 1 sticker. 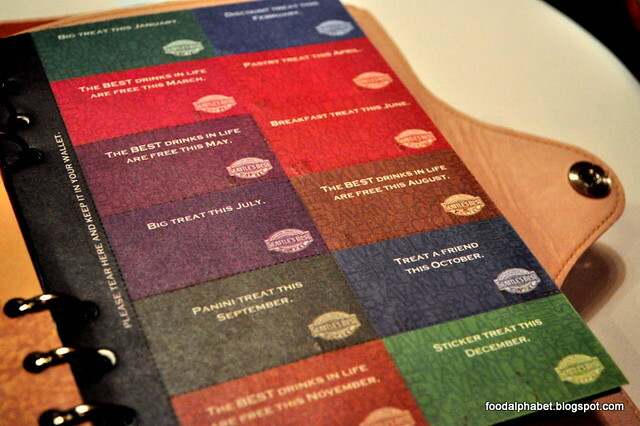 The 18 stickers compose of 8 Christmas featured drinks, and 10 regular menu drinks. Compile them up and exchange for a Seattles Best 2014 Dream Journal. Max of 2 cards combined. You may collect your stickers until January 15, 2013. 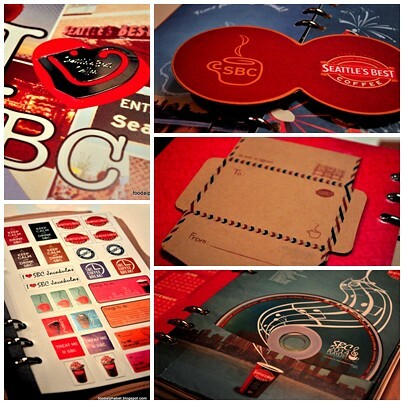 You can redeem your SBC 2014 Dream Journal until March 16, 2014 only. Collect all 4! 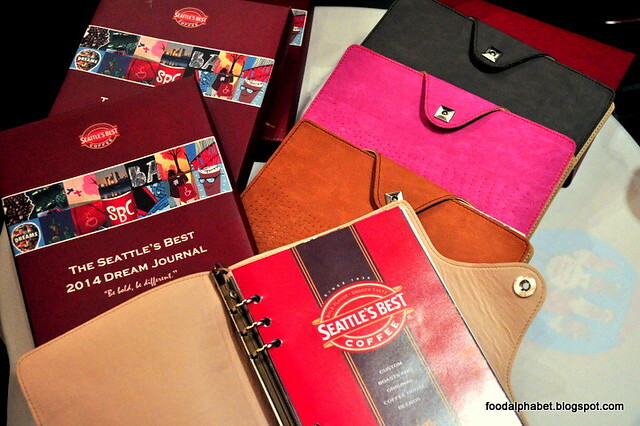 But since it's Christmas and we are feeling the love you have given The Food Alphabet, we are giving away 1 SBC 2014 Dream Journal, thanks to Seattle's Best Coffee Philippines! Join in Rafflecopter, and 1 lucky reader gets to bring this home! Giveaway is until Dec. 31, 2013. Anyone can join! We will send your prize wherever you are in the world! This year's theme promises to bring out the kid in all of us. Feel "Christmas inside a toyshop" and reminds people of the feeling that they had when they were kids during Christmas time. Enjoy the many sights and sips of Seattle's Best Coffee with drummer boy and toy train displays, alphabet toy blocks and more! 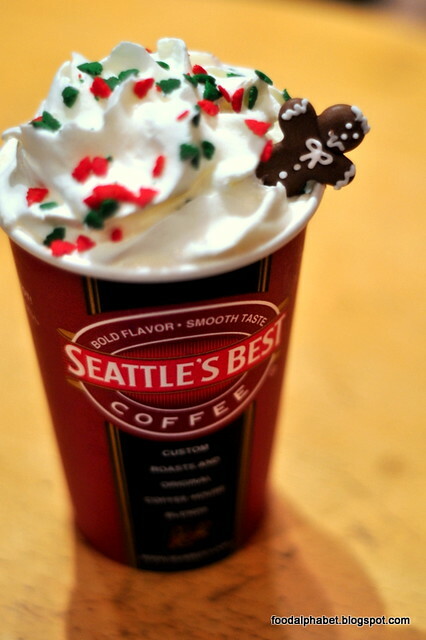 It's definitely Christmas at Seattle's Best Coffee. Post your complete name, email together with your Facebook URL or Twitter post URL.